Sometimes, it can be easy to feel trapped within your own head, your own self. 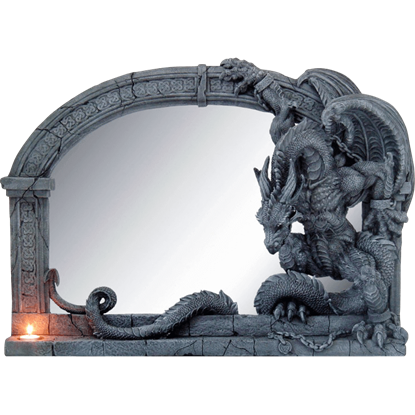 Just ask the Chained Dragon Wall Mirror. This poor, defeated wyrm is imprisoned against the glass, forced to stare at only himself all day long. 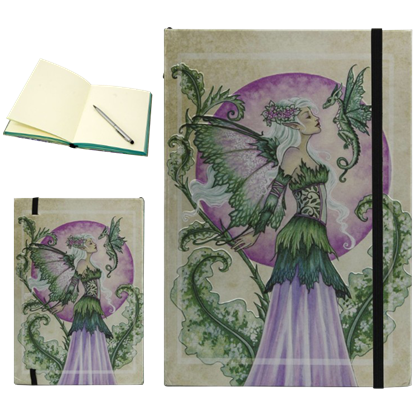 The Discovery Embossed Fairy Journal shows a serene fairy maiden in purple and green as she meets a baby dragon. 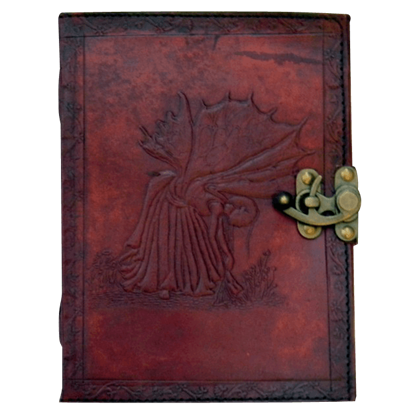 Let the fantasy scene embossed on the cover of this fairy notebook inspire the writings and drawings you record within. Sometimes you just have to spread your wings and fly. 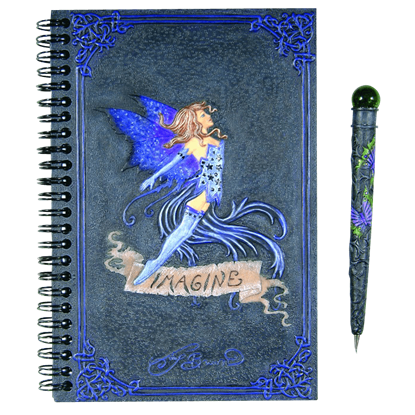 In a metaphorical sense, this Embossed 6x8 Fate Fairy Journal with Lock can allow you the freedom to do just that, by allowing your imagination to soar with the possibilities. Far from the pastel hues of daytime fairies, the Embossed Arachnafaria Notebook displays a gothic fairy who showcases the ominous beauty of the night. Spiders suit this fairy far more than flowers in her fashion and demeanor. Warm, bright shades are shunned by fairies of the night. 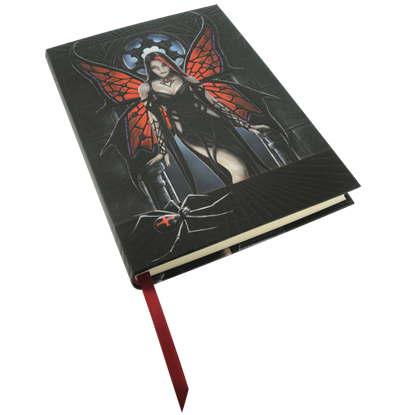 Deep purples and violets convey a shadowy feel in this Embossed Immortal Flight Notebook, in which a gothic fairy peers into a rippling pool and sees a skull reflected. 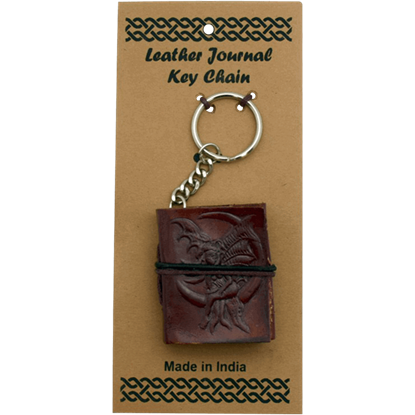 Being one of the smallest fantasy creatures, the fairy on the cover of the 2 inch Fairy Leather Embossed Journal Key Chain is probably actual size. Do not miss a chance to write something down! Keep this key chain on your ring! Nothing beats a good journal or notebook. They are indispensable for recording thoughts and dreams. A personalized journal is even better, so if you need a new notebook, perhaps this Fairys Secret Dell Journal is the one for you. Glimpse into an enchanted green realm on the front and back cover of the Guardian Embossed Fairy Journal. 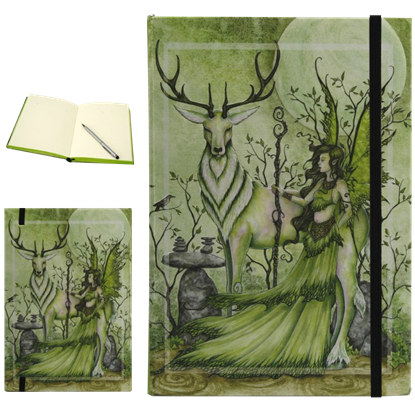 This unlined fairy notebook depicts a forest guardian fairy standing next to a mighty stag and a mysterious stack of rocks. 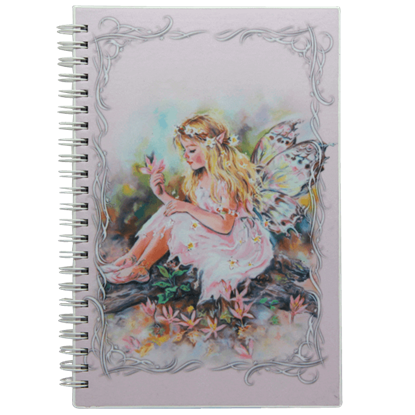 The I Do Believe in Fairies Journal Set by Amy Brown features a journal and pen with Amy Browns classic fairy artwork. This journal set features a fairy above a banner that reads I Do Believe in Fairies. This item would make a great gift. 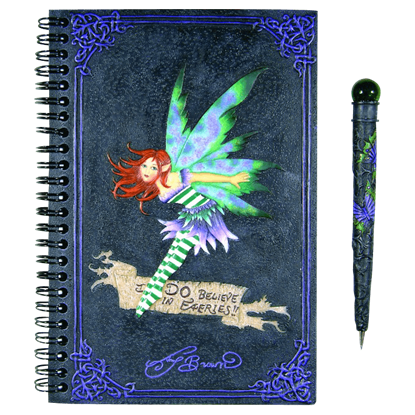 The Imagine Journal Set by Amy Brown features a journal and pen with Amy Browns classic fairy artwork on the cover. 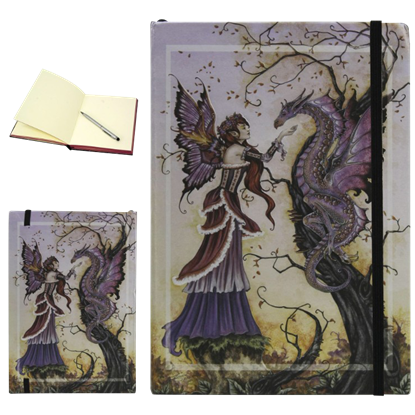 This journal set features a fairy above a banner that reads Imagine. The cover is made of hand painted cold cast resin. 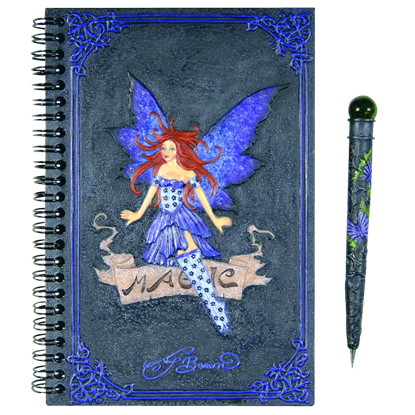 The Magic Journal Set by Amy Brown features a journal and pen with Amy Browns classic fairy artwork on the cover. This journal set features a fairy above a banner that reads Magic. This item would make a great gift for a writer.